Trap - The Chip's Challenge Wiki - The Chip's Challenge Database that anyone can edit! A trap, often called a bear trap and called this by Melinda, is a tile that restricts from movement any object that steps on it. The only way to release the trap is via a brown button that is connected appropriately to it. When a trap is released, it is termed open, and when not released or not connected at all, it is closed. In MSCC, if running with the black and white option, a trap appears as a black circle with a T on it to let the player know it's a trap. More than one brown button can activate the same trap, but only one trap is released by one brown button; only the first trap a brown button is connected to will be released. To change trap connections, either disconnect or reconnect them (in ChipEdit), or go to the "Trap Connections" menu and disconnect the tiles (in CCEdit or CCLD). In the DAT file of the Microsoft port of the game, the number of connections is limited to a maximum of 25 per level. When the appropriate brown button is read as pressed (see Button Smash Glitch), or if it starts on the lower layer, the appropriate trap will allow any object on it to move, although MS rules allow objects to remain on an open trap. An open trap functions as acting floor for as long as it is open. An object that falls into an unconnected trap remains there for the duration of the level, since there is no way to open it. 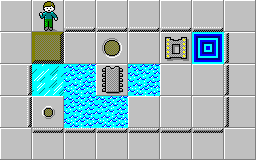 If an unconnected trap is on the lower layer, it will still trap Chip and blocks that run onto it and be erased by monsters. In the case when there is a connection, the trap will not work on Chip when revealed, and will allow Chip to move onto the square after a block in exchange for being trapped himself. Normally, this is not permitted, as covered in the next section. Although blocks can also be trapped in traps and released, they become acting walls until the trap is opened. If a block slides into a trap, the block will slide an additional space in the direction it was sent in when it is released, because it is still on the sliplist for one further move. This can be seen in Torturechamber. Even though they may not be connected to anything, traps can often be used to ensure specific monsters that fix the Controller and Boss Glitch stay facing a certain direction, and can even appear as special types of "walls" in levels such as Strange Maze. In Lynx, an open trap forces an object that touches it, whether it stepped into the trap while it was open or closed, to slide across it as if it were an ice tile. Although there is no sliplist in Lynx, Torturechamber can still be solved there because of this mechanic: the block, when released, will move L a second time and elicit the same result as in MS. Although Chip, when coming out of traps, cannot use boosting after this move,  is still saved in comparison to the usual  when sliding rather than skating over one ice tile. Ladder's bold time in Lynx is 241 compared to the MS bold of 232. In both rulesets, Chip will move D to send the block sliding onto the button and 2R into the trap. However, in Lynx, Chip is automatically slid horizontally from either side of the trap, such that he cannot reach the computer chip. In MS, Chip can simply move DU to pick it up.